This family is represented in Australia by a single genus, Hydrometra Latreille. Ecology: Instream habitat: Hydrometra species are semi-aquatic bugs that occur in vegetation covered quiet waters such as permanent or temporary pools, ponds, billabongs and littoral areas of creeks and rivers. They are commonly found on the vegetation close to the water margin, only occasionally crossing large stretches of open water. These bugs are generally found in freshwater but are also known from saltwater, brackish water and from rock surfaces above the water line. Feeding ecology:Hydrometra bugs are predators or scavengers on dead or dying arthropods found on the water surface, typically midges (Diptera: Chironomidae), mosquito larvae (Diptera: Culicidae), bloodworms (Diptera: Chironomidae), shrimps (Decapoda) and springtails (Collembola), but are capable of spearing live invertebrates through the surface film, typically mosquito larvae (Diptera: Culicidae), cladocerans (Crustacea: Cladocera), and ostracods (Crustacea: Ostracoda). 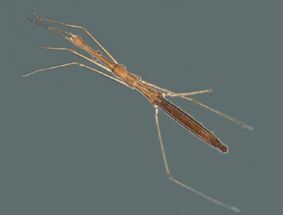 They timidly approach the prey, waving their long antennae (with specialized sense organs at the tip).The prey is speared with a long and slender rostrum and usually carried to land where every bit is sucked out. 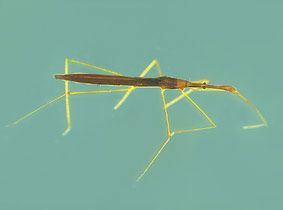 Habit: Hydrometra are stick-like bugs, commonly known as �water measurers�, referring to their slow measured movement across open water. These bugs are cryptic with their slender limbs and body allowing them to blend with the vegetation. In Northern Hemisphere observations, Hydrometra have been seen to raise and lower the body rhythmically to obscure the body outline and they also become immobile (�play dead�), when handled roughly, with antennae stretched forward and legs pressed against the body. 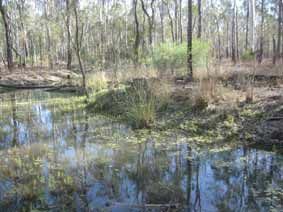 Life history: The complete life history of Australian Hydrometra species is not known. Adults of the most common species, Hydrometra feta and Hydrometra strigosa, are active throughout the year with nymphs recorded from January, March-July, August, and October- December. Most Australian Hydrometra species are wing dimorphic, with macropterous forms being the most frequent adult form. Flight activity may be restricted to daylight hours as Hydrometra are not common in light trap collections. The hydrometrid egg has a multilayered shell and a distinct pedicel. Eggs are normally laid up to several centimetres above the water level, on vertical objects and attached in an upright position by its pedicel. The egg is tolerant of dry conditions. The embryo has a frontal appendage which is used to produce a longitudinal split prior to hatching.